Some Windows 7 and Windows 8.1 users have begun to howl over Microsoft's practice of automatically upgrading their PCs to Windows 10, saying that they were never given a chance to decline the upgrade before it installed itself. That was contrary to how Microsoft has described its aggressive strategy of pushing Windows 10 to devices running older versions of its operating system. It stuck to that today. "Customers continue to be fully in control of their devices, and can choose to not install the Windows 10 upgrade or remove the upgrade from Windows Update (WU) by changing the WU settings," Microsoft said in an emailed statement. That's not what some users experienced last week. "My computer was working great last night [but] this morning it says, 'Microsoft Legal Agreement' with bunch of legal information and WAY at the bottom 'Accept your new Windows 10' or 'Decline,'" wrote a someone identified as scifixtion in a Friday post to Microsoft's support forum. "I hit Decline and it says, 'It will take a few moments to go back to your old Windows software,' [but] then it goes black and go[es] right back to [the] Microsoft legal agreement [and shows] 'Accept windows 10' or 'Decline.' I've hit Decline a dozen times and it won't budge." The legal agreement that scifixtion referenced was the Windows 10 end-user license agreement, or EULA. Others took to Reddit to report that their PCs were upgraded to Windows 10 while their backs were turned. "I leave my house for 2 days with my computer on, I come back and I have Windows 10. What. The. F***," said MalekuaMan yesterday on Reddit. "So my Windows 7 machine was upgraded to Windows 10 without my permission about 2 days ago," echoed rtn1797. "I downgraded [to Windows 7] but now there is a prompt that is continuously open and asking me to select a time for my Windows to update to 10. WTF?" Some said that the EULA -- where users were given a final opportunity to reject Windows 10, albeit a process that then took time to restore the previous operating system -- appeared out of nowhere. Others reported that their systems had upgraded themselves after they'd been away from the keyboard for days, or perhaps just hours. "This is happening to my desktop which runs [Windows] 8.1. A few days ago I came back from the shower to find my computer in the process of doing the upgrade by itself," said Heck_Tate on Monday. "I had to wait for the entire thing to complete, decline the EULA, and then wait for it to reinstall previous OS. It's now in the process of doing the exact same thing again and I'm about ready to just say f*** Windows and go with Linux." Last October, Microsoft announced that it would push the free Windows 10 upgrade to eligible PCs automatically, a practice that actually began six weeks ago. The company has repeatedly said -- including yesterday -- that users could decline the Windows 10 upgrade at some point during installation, but has refused to say whether the upgrade starts in all cases, document how the user authorization process plays out, and spell out whether it appears again later when a user snubs the offer. Thus, the fact that machines have tried to upgrade without user action wasn't new: Microsoft has acknowledged that that is its intent. Instead, it's the fact that some users have been unable to abort the installation, restore the older OS after 10 arrived or have received the upgrade when they've ticked the don't-upgrade-automatically settings for Windows Update, that are at issue. One user, a small business owner in Eugene, Ore., told Computerworld last week that his PC -- which he uses primarily to run QuickBooks -- displayed the same two-option message that scifixtion described. Clicking "Decline" did no good: The display returned. In order to retake control of his PC and access QuickBooks to draft invoices, Jeff -- he asked that his last name not be used -- was forced to let Windows 10 install. "I'll be looking at a Mac for my next computer," Jeff said. There are ways to block the Windows 10 upgrade from installing on an eligible PC. Microsoft has published instructions for editing the Windows Registry -- a dangerous chore for inexperienced users -- that will do the job. And Josh Mayfield, a software engineer and developer, has created a tool dubbed GWX Control Panel that keeps track of incoming updates, detects those that are designed to force-feed Windows 10, and thwarts them. On Monday, Mayfield did not have an explanation for the flood of complaints about the Windows 10 upgrade -- his multiple-PC test pool, as well as the bulk of the users of his GWX Control Panel, run the application, and so shouldn't see such conduct. But he did reveal that traffic to his website and the number of downloads had tripled in the four days prior. "I am still not completely sure why," Mayfield said in an email replay to questions. However, Mayfield has seen traffic and download spikes before, notably in the fall of 2015 when users noticed "Upgrade to Windows 10 Home" or "Upgrade to Windows 10 Pro," in Windows Update, Microsoft's updating service for consumers and small businesses. At the time, those items appeared in the Optional section of Windows Update's listing of available patches and fixes, but Microsoft had pre-selected the upgrade (even though that was counter to convention). Users with Windows Update set to automatically retrieve and install updates -- the default setting -- or who did not examine the optional update list, were then served with the Windows 10 upgrade, whether they wanted it or not. "My guess is that [people now reporting unexpected upgrades have PCs that] are configured both to install Windows updates automatically and they also have the 'Give me recommended updates the same way I receive important updates' checked in Windows Update settings," Mayfield said. Another possibility, said Mayfield, was that users who had previously set Windows 7 or 8.1 to not update automatically -- thus stymying a Windows 10 upgrade -- had had those settings changed by Microsoft. "I have had reports from three different users in the past week who've seen their Windows Update settings change from one of the three options that don't automatically install updates to 'install updates automatically,'" Mayfield noted. 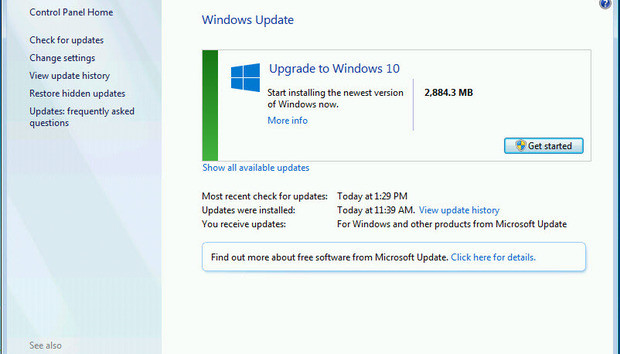 Microsoft regularly updates Windows Update, and in the past, some of those updates have switched user-selected settings or pre-checked optional updates. Recent refreshes of Windows Update -- the latest was issued on March 8 for Windows 7 and Windows 8.1 -- may have done just that, triggering the automatic upgrades on PCs that should have been immune from a forced migration. What remains unclear is whether the behavior -- specifically, the completely-hands-off Windows 10 upgrade -- reported by users was by design or another goof. The Redmond, Wash. company declined to clarify. When asked to explain why users were seeing their PCs upgraded without a chance to decline, or were trapped in an endless loop that eventually forced them to acquiesce to the upgrade in order to regain control of their machines, a Microsoft spokesman provided a boilerplate statement that repeated what the company has said before about Windows 10 upgrades. "[As] we shared in late October on the Windows Blog, we are committed to making it easy for our Windows 7 and Windows 8.1 customers to upgrade to Windows 10," the spokesman said. "As stated in that post, we have updated the upgrade experience to make it easier for customers to schedule a time for their upgrade to take place." In the referenced blog post of Oct. 29, 2015, Terry Myerson, who leads Microsoft's operating systems and devices group, announced that Windows Update would be used to serve Windows 10 upgrades to eligible consumer systems. The practice was extended in January to business PCs not managed by an IT staff. Back in October, Myerson promised that users would be able to block a Windows 10 upgrade without resorting to fiddling with the registry. "You can specify that you no longer want to receive notifications of the Windows 10 upgrade through the Windows 7 or Windows 8.1 settings pages," he said at the time. Microsoft has yet to provide those settings for Windows 7 and 8.1. In the meantime, many users were steamed. "This happened to two of my PC's a few days ago," said jamierocks369 on Reddit today. "I missed it on the first PC and had to roll back [to Windows 7] and then do a system restore as the rollback still didn't return the PC to the original Windows 7 state. Luckily managed to catch it on my second PC as I was about to restart for updates. Not cool, Microsoft." "This bricked my father's computer. He was prompted to install a driver disk which he didn't have during installation, leading to a crash which totally crapped out his system," berniesright added to the Reddit thread on Sunday. "After many hours I was able to do a fresh install with my Windows 10 disk, only to discover that his computer now couldn't be activated, as the OEM number was no longer recognized. Real s***storm. [About] 12 hours wasted on this, plus all my father's data lost and still more OEM hassle to deal with. F*** Microsoft."